DRE have been supplying 4000lb 12-Volt Winches for over 20 years. The 4000lb Winchesare supplied at our workshop situated in Bunclody Co. Wexford Ireland, at the Wexford, Wicklow and Carlow borders. 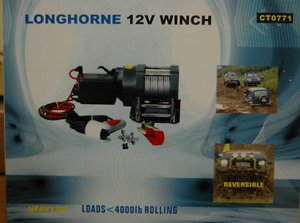 Longhorne 12-volt reversible winch with 4000lbs rolling pulling power. Comes supplied with a remote cable for forward and reverse and also comes complete with a pulley and hook. Ideal for launching or loading your boat, for pulling your car out of mud and for pulling out tree stumps.